My uncle, Patrick Warren, flew off the HMS Illustrious in WWII. In May 1945, the Barracuda, FX 87042, he was in, along with Kenneth J. Tomlinson, and Roy L. Wilcox had a mid-air collision with Barracuda FX 87104 off of the coast of Alexandria Egypt. On board the other Barracuda were William E. Andrews, Maurice W. Ratnett, and James S. Thomson. I was wondering if anyone had any pictures to share on line of these two crews. The information you have given me does not match the information I have. I have looked at several resources that I have and here is what I found. There were 3 aircraft involved in the mid-air collision, one landed safely at Dekbelia. All three were of 827 Squadron FAA and were based on HMS COLOSSUS (not ILLUSTRIOUS). All three were Fairey Barracuda II aircraft. Aircraft SN. PM749 (not F87042, that is the service number of WILCOX) all crew killed. Crew: Sub-Lieutenant (A) William Ernest Andrews, RNVR and Leading Airman James Syrett Thomson, RN (FAA/FX 87104). Crew: Sub-Lieutenant (A) Maurice Walter Ratnett, RNVR and Leading Airman Roy Langley Wilcox, RN (FAA/FX 87042). The third aircraft was PM826. They were reforming after a dive bombing exercise when the crash happened. I hope this helps. If you have some other official document(s) which disagrees with this please send them along so that I can correct the record. 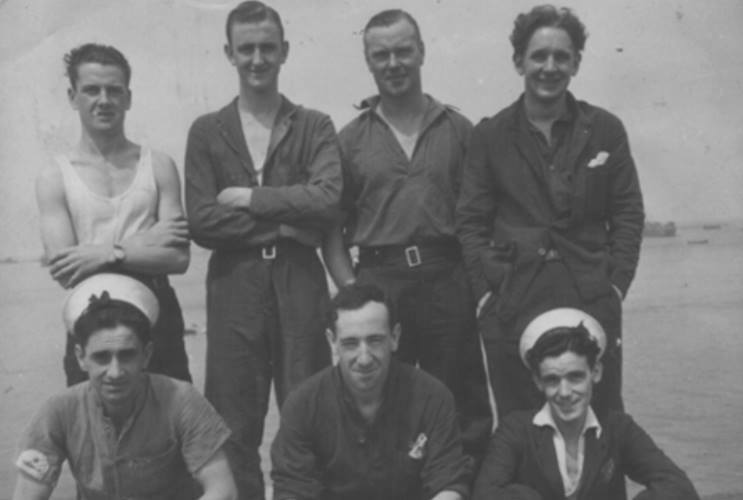 A photos from HMS COLOSSUS, my father is on the back row on the right. His name is F. J. TRODD, he past away in 2008. My Dad, Philip Harry Davison was a member of the crew of HMS Colossus at some point between October 1942 and October 1946 (his total RN service). He worked in the Engine Room. Your photo, posted on the HMS Colossus crew photos page describes the young man on the left as "unidentified crewman in the engine room of HMS Colossus during World War II," but is almost certainly my Dad, a lovely photo of him as a teenager (he was born 7 September 1924). Today I've asked other family members today for their views (his wife, his other son and his granddaughter) and they think it is him with 99.9% confidence. Dad has just passed away (5 November 2017) but I thought you should know that we think we've identified the 'unidentified crewman...' in your photograph. I have recently noticed in one of the pictures of the crew posted by Ian Trod taken on Christmas Day 1945 aboard the HMS Colossus is my father John W. Evans, sitting front row second from the right. Although he never had to much to say about his service years he did name the two ships he served on, HMS Colossus and HMS Canton, I do have several pictures of him aboard the Colossus on deck with his serving seamen. I thought it would be nice to let Ian know another name to his photograph, if you could pass it on that would be much appreciated. Unfortunately my father died in 1992 aged 69. I have just stumbled across this wonderful website. My mothers partner when I was a child was Geoffrey Guy, he served on HMS Colossus, I believe he was an aircraft mechanic. When I was growing up I used to look through lots of photos he had of the carrier and crew and aircraft. Sadly he passed away in 1984 and I guess his wonderful photos would have gone to surviving family members. Do any surviving crew members remember Geoff? Anyhow thanks for the memories. What a pleasure to just drop on your site having linked through Pinterest and subsequent links. My dad served on the HMS Colossus as a young recruit. He went to South Africa and into dry dock for repairs after colliding with a hospital ship in the Indian Ocean. As far as I know the crew were split up and looked after by local people until repairs were completed, which took approximately three months. I would be pleased to hear from anyone who could fill in any further history of this vessel. My father, Thomas McCaig, served on HMS Colossus 1944-46. He talked about going up in the planes to adjust the gyroscopes. Unfortunately he had a stroke in 1988 and was left unable to speak then died last year aged 87. He did talk about the ship being in collision with a harbour wall or something in Cape Town and I have memories of a photo showing damage to the front of the flight deck. There are also somewhere photos of him on a beach in Ceylon and of a celebration party for new recruits as they crossed the equator for the first time. I would love to hear from anyone who remembers him. Thanks for maintaining this wonderful website. My father was on HMS Colossus in WW2. I would love to know if anyone remembers my Dad as he died when I was 14 in 1971. His name was Gerald Christopher Parker. I believe he was a Petty Officer, and flew on Barracudas as a "spotter". I have some photos of his from his time, some from South Africa, Cape Town. Would love to hear from someone. My father, William (Bill) Green (aged 84) was reminiscing today and told me a little about his time spent on HMS Colossus. He was a stoker on LST's in the South Pacific and as the war ended the LST's were handed back to the Americans as they were only on loan for the duration of the war. He and fellow crew members were then transferred to the Colossus to work their passage back home. I'm sure he said he picked the ship up in Ceylon. He also said that the planes on board were bi-planes (not sure of the type), but maybe not, I'll have to get him to try and remember more. He doesn't know yet that I've found this site, he'll be thrilled when tell him. My Father served on the Colossus in 1945, he worked as an Airframe and engine fitter on the Corsairs. His name is Terrance Sharp and now aged 84. He may be in the picture of the Corsair taking off, as the one in the foreground with his back to the camera. IT would be good to know if any one remembers working with my father. What wonderful photos! My father, Philip Davison was a member of the boiler room crew on HMS Colossus in 1945. He is now 84. How can I get links to other crew-mates for him?